The least attractive part of the Camino, I feel. But still it holds a beauty that you can’t contain. I remember on my trip in 2013 walking alone for miles along this barren stretch and the only source of amusement was counting the trees on my left hand side. I think I reached 500 and stopped. 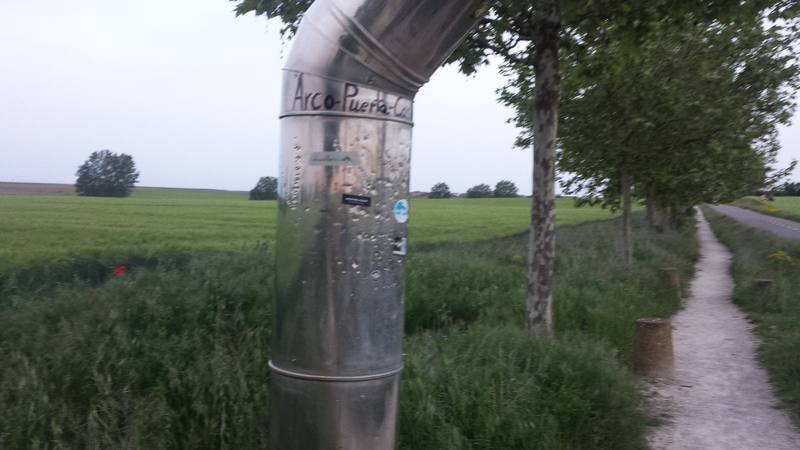 It has become a private joke between my Camino friends here in Ireland. This morning was an early one, like the morning before. But unlike Ledigos, there was plenty of light. I was in a large town! I left at 6am taking some paracetamol for my leg and hoping the pain would go away soon. The sleep did nothing to quell it but I did catch up on a few hours rest which was what I wanted. 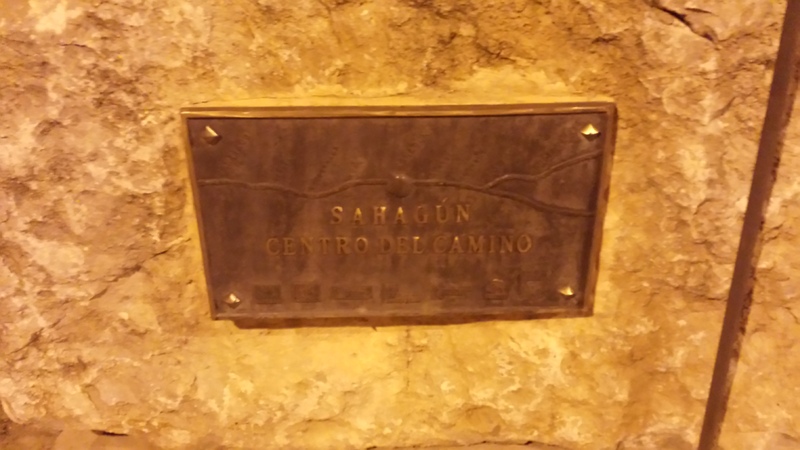 Sahagun is a nice town and I would like to see more of it the time I pass through. It was a crime I didn’t buy a Guinness in the Irish bar although Franz did and said it tasted “second hand”! You can’t beat the real thing! Leaving Sahagun is confusing to say the least and the fact that it was dark and I was alone make it worse. I walked over the bridge and along the main road but once you come to the roundabout, the directions led me astray. I waited for 10, maybe 15 minutes until some French pilgrims asked me which route I wanted to walk. “Oh to Bercianos please! !” was my response and they pointed me in the right direction. In 2013, I was luckily not alone so I didn’t have this problem. Onward I walk. Other pilgrims have the option of walking the Roman Road to Calzadilla de los Hermanillos via Calzada de Coto, but it is a long stretch. There are more towns to stop at on the Camino Real. I was on safe terrain now and thanked the French couple. It wasn’t long before the sun had risen and pilgrims had left their places of rest. 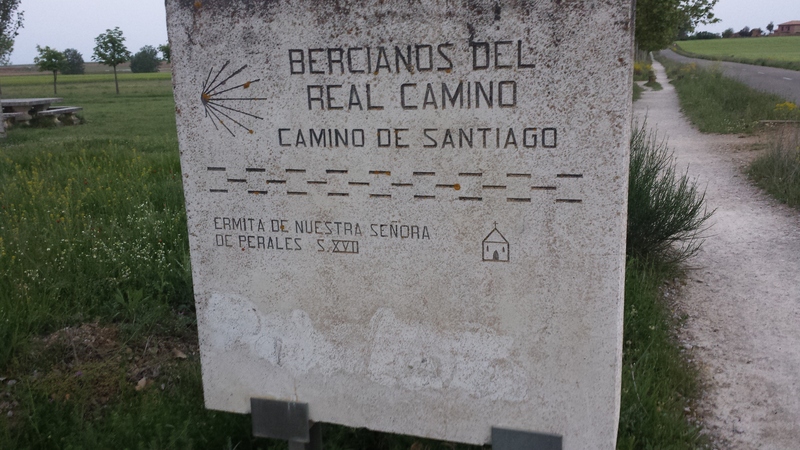 Bercianos de Real Camino was my first stop. I was eager to find the cafe run by a Spanish / English couple at the entrance of the town but in typical David fashion, I couldn’t find it. Had it closed? Were they not open this morning? Hmm! Once again, memories of my time spent in town in 2013 flood back. I also noticed a few more albergues and restaurants had opened up since I had passed through. I decided to leave breakfast until the next town El Burgo Ranero, some 15km from Sahagun!! El Burgo Ranero is much bigger than Bercianos with more albergues. 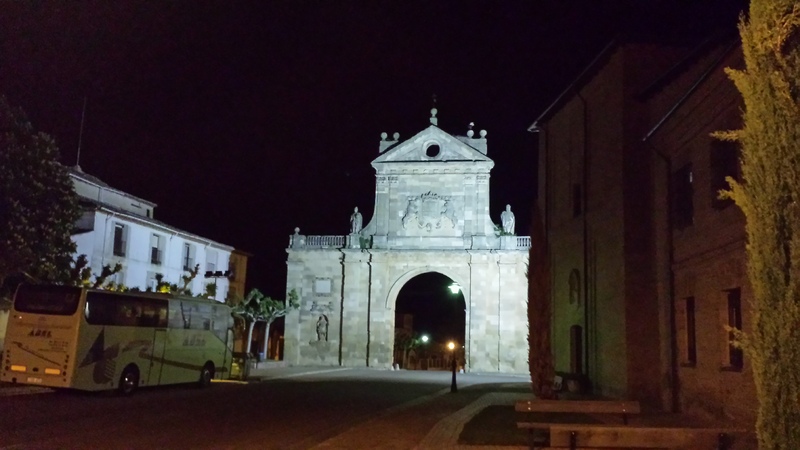 More people tend to stay here instead of Sahagun and it is listed as an end stage in Brierley’s guide book. Ah Brierley! I promised I wouldn’t mention him..ok..enough! The walk into El Burgo Ranero is pretty mundane. I listen to music on my phone and apart from the odd old building, there is nothing worth photographing. I’m walking alone also so it’s a great time to think things over. Reaching El Burgo Ranero is great. I stop at the first restaurant and order some breakfast. The cafe is crowded, mostly by pilgrims who have stayed in Bercianos the night before. I meet two women from Ireland who are walking the Camino in stages..this time from Fromista to Ponferrada. I overhear them speaking Irish, which is very unusual when abroad. I didn’t want to disturb them so I waited until I had ordered and sat down to said hello. It was great to talk to them. They had their day packs and were clearly taking a more relaxed attitude to other people. I ordered them another cafe con leche! I also met Mary from Florida, who was in her 70s. I would meet her many times down the line but one thing I noticed about her was her determination. She just kept on going. I moved on eventually, hoping to reach Reliegos before this leg gave out. The next 11 or 12kms is uninspiring..pretty much! However, I enjoyed the alone time! I played games to ensure I kept the same pace..”what’s over the hill?..Most of the time, it is usually nothing, but I just didn’t want to go back to counting trees. The weather was perfect, not too hot, not too cold either, and we had cloud cover. I also heard a lot about Elvis in Reliegos..He owns a bar “The Blue Bar” as it is known. It’s an albergue as well, but I’m not sure many people stay there. I wondered if I would see the guys again as we made no plans on where to stay tonight. I just assumed they would aim for Reliegos but wouldn’t it be funny if they turned up in the same albergue as me?? I arrived in Reliegos after 3 more hours. As you enter the “town”, there is a bar so I bought a cool cerveza and an aquarius. Maybe the guys would turn up while I waited outside. After half an hour, I went in search of the albergue “Las Paradas” which is at the back of the town. It’s nothing special but it was clean, a big plus in my books! The owner acted like he had a chip on his shoulder, I don’t think I saw him smile when I was there. I washed my gear, had a shower and put my feet up in the patio area. Next, Tom, Caroline, Franz and Tina walk in. I have no idea! I was delighted. They were joined by another German guy called Andreas whom we had dinner with that evening. Another great night. I didn’t get to see Elvis’ bar in the end. Maybe another time. Tomorrow I walk into Leon. It’ll be like meeting an old friend again having being here twice before. We will be back walking as a group also. After dinner I got some great news also as someone was prepared to wire me Western Union funds to keep me going until I return home. I just needed to visit the Correos in Leon and I could collect it. Good times! It’s great to read your blog, having recently finished it ourselves. We restarted from Bercianos, after finishing there last September, so your latest postings are very relevant to us. It’s a shame that you didn’t see the “Elvis Bar” in Reliegos, it’s definitely worth seeing, there was nothing quite like it anywhere else on the Camino as far as we were concerned. Looking forward to hearing how you managed your injured leg and overcame the money problems. Hi Tony, that’s right. I’ve followed your blog right through to Santiago. Unfortunately, I had a little too much siesta when the rest checked in on Elvis 🙂 but no doubt I will have another chance to see him. I’ll be posting more in the next few days. Just after I posted my previous comment I realised that I had some photos of the “Elvis Bar” in Reliegos in my blog. 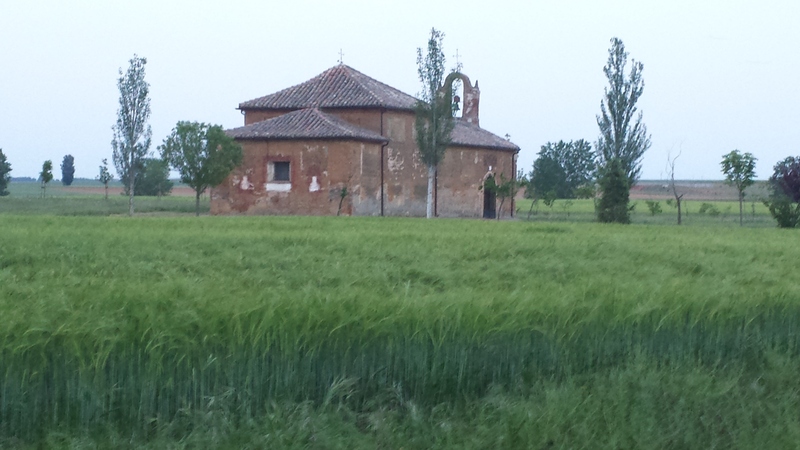 You can see them at https://carrollsinspain.wordpress.com/2015/05/01/camino-day-24-to-reliegos/ if you wish. Yes, that’s the man himself. Great pictures indeed! Also, it seems we stayed in the same hostal in Sahagun. I stopped in on Elvis. He is hilarious. Also his food was best in town. I didn’t eat but was told.